Isla Mujeres accommodations range from Hotels, Boutique Hotels, Vacation Rentals, All Inclusive Hotels and Packages as well as Hostels. Explore our list of options to find the right accommodation for you. Whether you’re looking for a budget or luxury hotel in downtown Isla Mujeres, there are options for everyone. 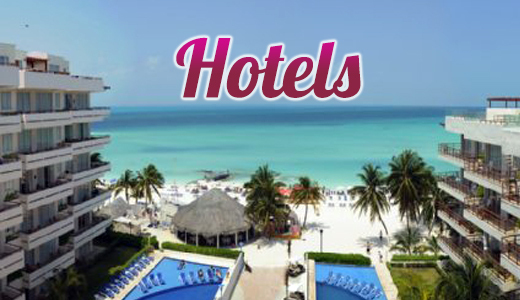 Luxury Hotel in Isla Mujeres with All Inclusive Options Located downtown North Beach. Boutique Hotel in Isla Mujeres Located on the east side of Playa Norte. Hotel Rooms in Isla Mujeres Located on the east side of North Beach. Hotel and Condos in Isla Mujeres Located on North Beach. Hotel Rooms in Isla Mujeres Located on Rueda Medina. Hotel Rooms in Isla Mujeres Located on Vicente Guerrero, close to North Beach. Hotel Rooms in Isla Mujeres Located on Rueda Medina close to North Beach. Hotel Rooms in Isla Mujeres Located downtown on the south side of the square. Hotel in Isla Mujeres Located downtown closer to North Beach on Calle Matamoros. Hotel Rooms in Isla Mujeres Located on the north end of Hidalgo. Hotel Rooms in Isla Mujeres Located on Hidalgo closer to the square. Located downtown at the south end of Rueda Medina. Suites in Isla Mujeres. Located on Hidalgo. Hotel Rooms in Isla Mujeres Located on Rueda Medina closer to North Beach. Hotel in Isla Mujeres. Located on Abasolo. El Milagro is a quaint hotel with lots of charm & character located on the Cancun side with a marina. Hotel with restaurant overlooking the Cancun Bay. Hotel Rooms in Isla Mujeres Located at South Point. Sac Bajo offers a certain secluded peace and tranquility like no where else on Isla Mujeres. We recommend renting a golf cart for easy convenience to town and local shops etc. Luxury Hotel in Isla Mujeres Located on Sac Bajo.